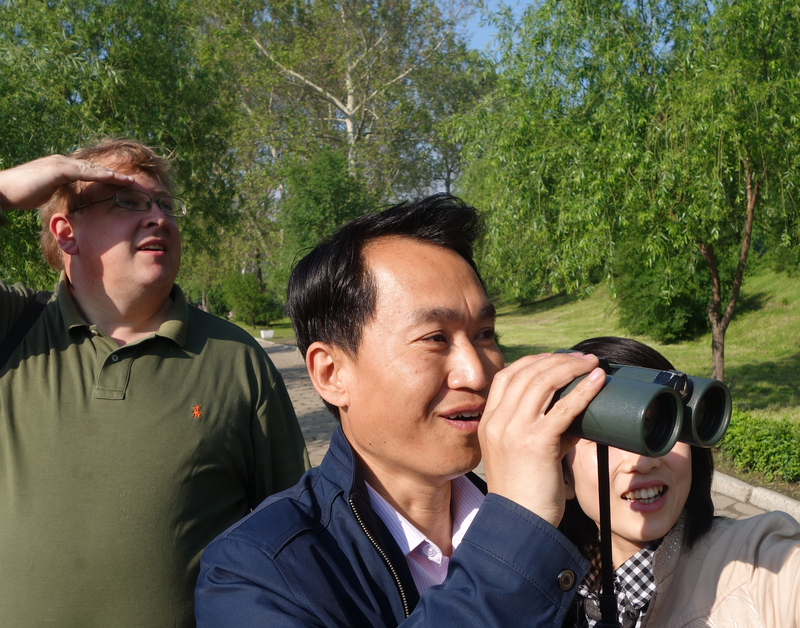 Bird News from Dr Nial Moores (Birds Korea) with Dr Bernhard Seliger and Felix Glenk (Hanns Seidel Foundation, Korea), Professor Lu Cai (Beijing Forestry University), Li Jia (IUCN, Bangkok office) and MOLEP. 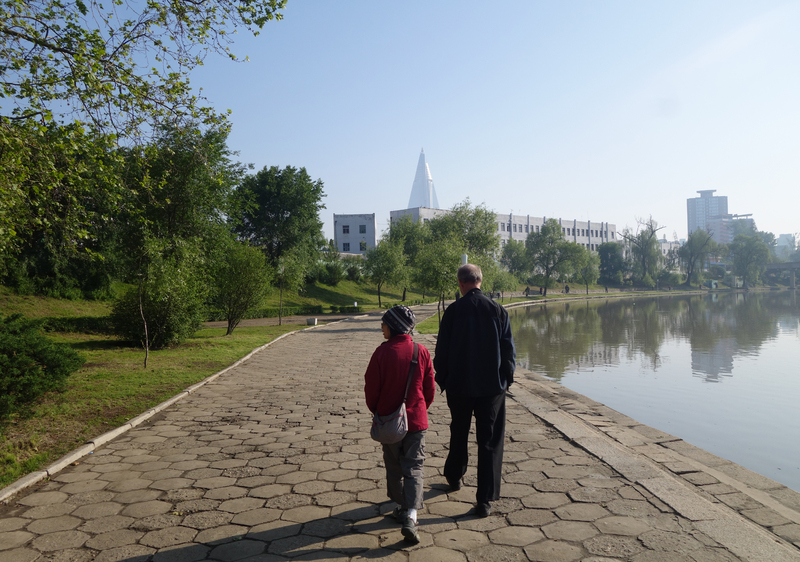 After arriving on May 16th, we presented at two symposia in Pyongyang on May 17th and 18th (the first, to celebrate “World Migratory Bird Day”; the second to mark the “International Day for Biodiversity”) as part of existing non-political commitments to a longer-term conservation process initiated by the Hanns Seidel Foundation, the Ramsar Secretariat and other international and domestic organisations. 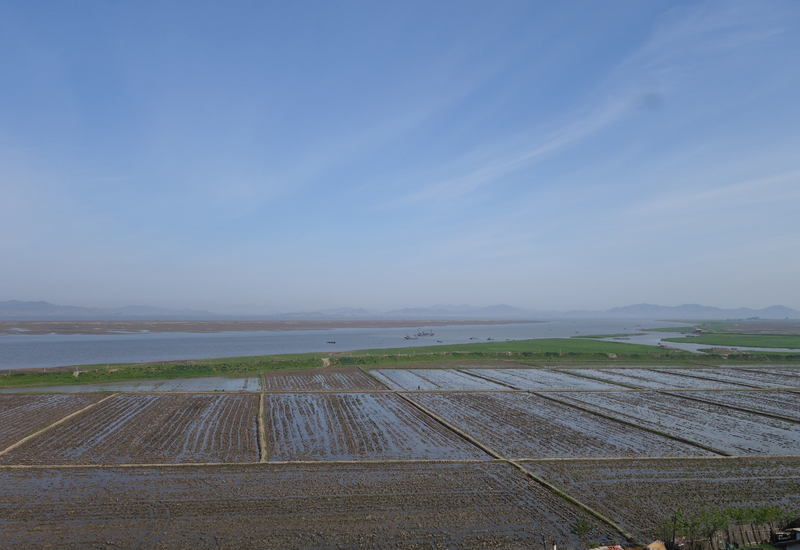 On both the 16th and 17th we also had an hour or so of birdwatching along the Taedong River in the city. 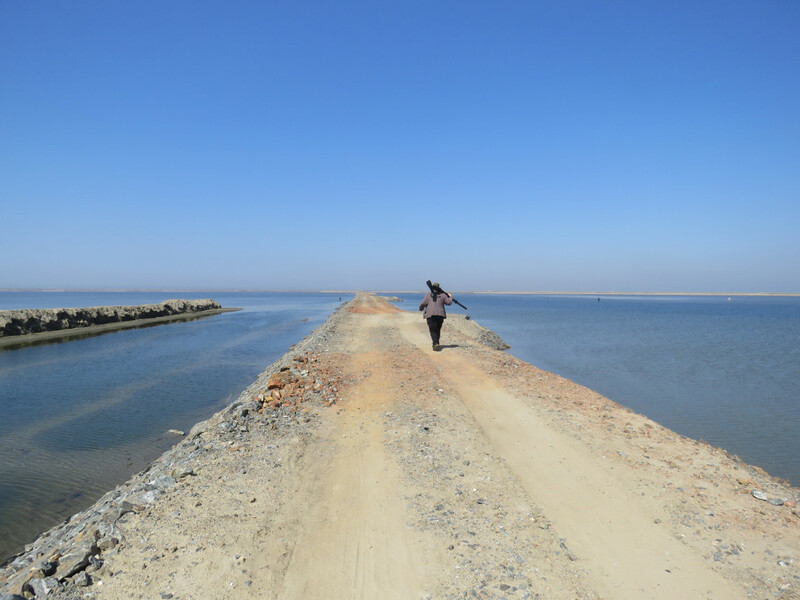 This was followed by two days of field survey (on 19th and 20th) to help identify potential Ramsar sites that the DPRK could designate when/ if they accede to the Ramsar Convention. Birding in Pyongyang: above Ms. Li Jia (IUCN) and Spike Millington (Chief of the EAAFP); and below our two kind and very hardworking guides from the Ministry of Land and Environmental Protection (Mr. Kim and Ms. Bang) with Dr. Bernhard Seliger (Hanns Seidel Foundation) on the left © Nial Moores. In total, we logged 106 species of bird, with a dozen or so species in Pyongyang itself (the only place we saw Mandarin Duck) ; a few seen during road journeys (mostly through a rural landscape of rice fields, farms and hillsides with scant forest cover as in the first image below); and the majority in highly-restricted coverage of parts of Onchon County (Ryong Gang Hot Spring Resort and Zhongak-Ku reclamation area – a huge “mini” Saemangeum – and a near-by Tree Nursery) and Mundok County (with two stops made on the southern side of the Chong Chon and Taenyong river estuary, as shown in the bottom two landscape images). 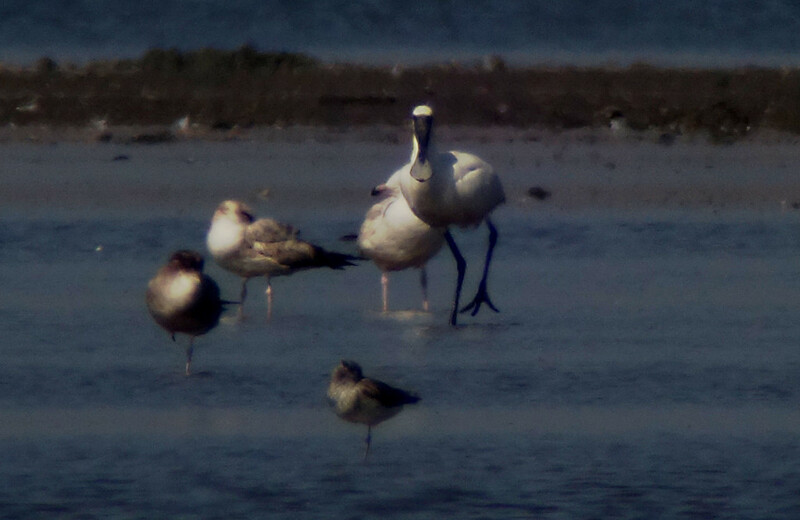 Black-faced Spoonbill Platalea minor (Endangered). Singles in Onchon County on 19th and in Mundok County on 20th. Chinese Pond Heron Ardeola bacchus (Least Concern). Two near the Ryong Gang Hot Spring Resort, Onchon County on 19th. Tomek (1999) found only two records, neither of which were in South Pyongyan Province. 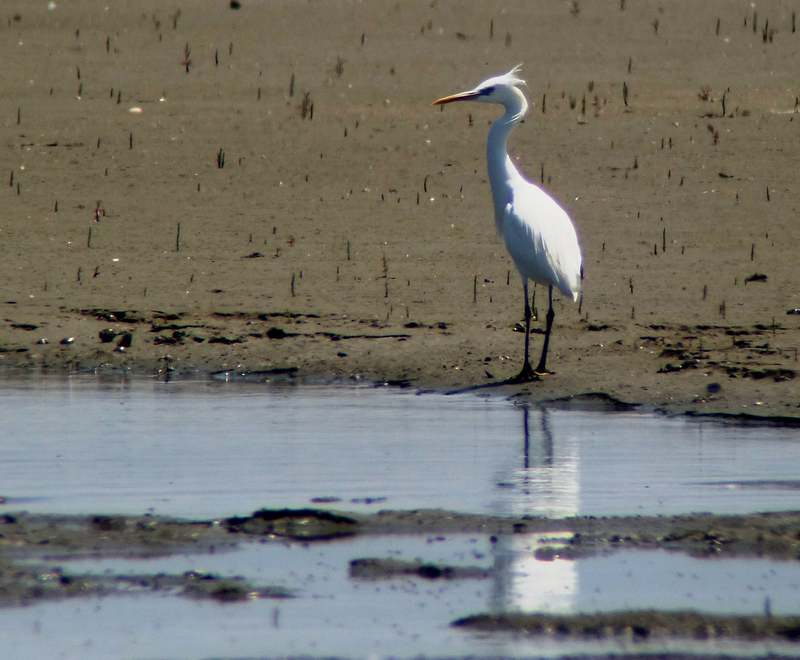 Chinese Egret Egretta eulophotes (Vulnerable). One in Onchon County on 19th. 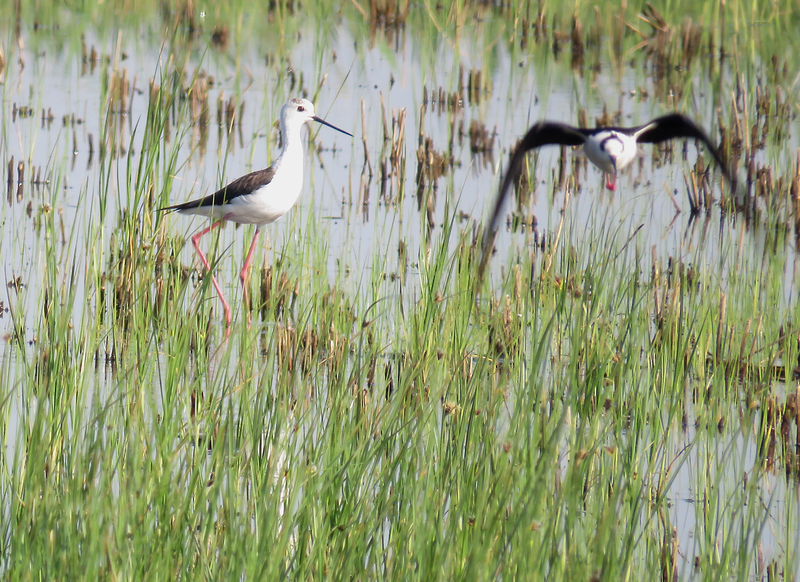 Black-winged Stilt Himantopus himantopus (Least Concern). 11+ were seen in Onchon County on 19th. Tomek (1999) found only two records, though it is clearly (now?) more regular than her research suggests. For example, 14 were found at Mundok in April 2009 and five were also recorded in the same area of Onchon County during the joint Pukorokoro Miranda Naturalists’ Trust and NCUK survey in early May 2015. Far Eastern Curlew Numenius madagascariensis (Endangered). Two in the Zhongak-Ku reclamation area on 19th and 15+ in Mundok on 20th. Great Knot Calidris tenuirostris (Endangered). Two in the Zhongak-Ku reclamation area on 19th. Caspian Tern Hydroprogne caspia (Least Concern). 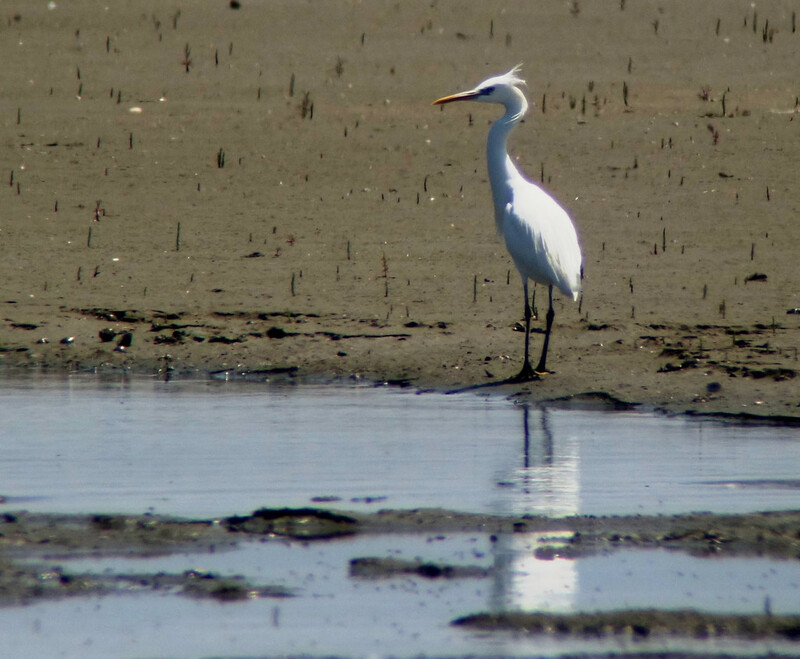 One photographed in the Zhongak-Ku reclamation area on the 19th. This species was first recorded here in the Republic of Korea in 2001, and Tomek (1999) gives no records for the DPRK. The Pukorokoro Miranda Naturalists’ Trust and partners in the DPRK saw one at So Ho-ri, Mundok on 26 April 2009. 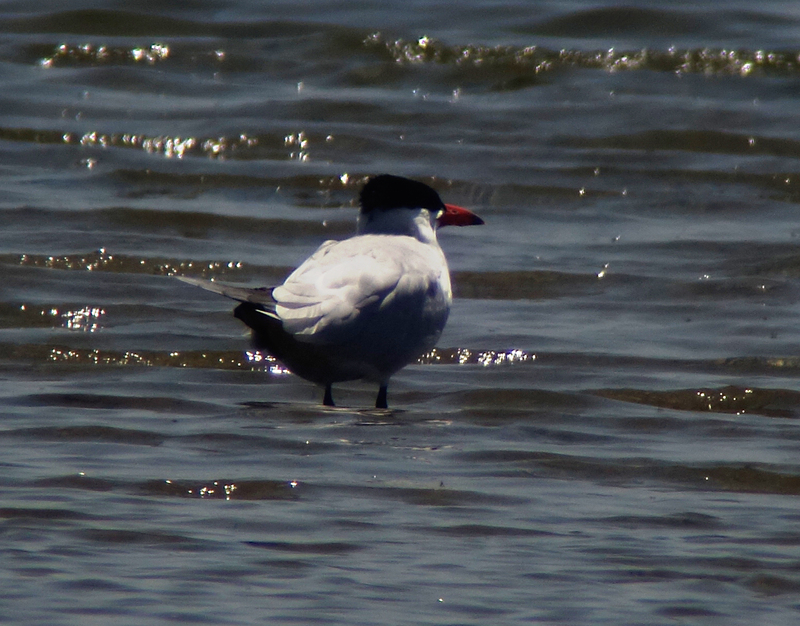 Have any other researchers also seen this species in the DPRK ? Black Drongo Dicrurus macrocercus (Least Concern). One in the Zhongak-Ku reclamation area on 19th. Tomek (2002) gives only one record, from the far northeast. Light-vented Bulbul Pycnonotus sinensis (Least Concern). One photographed in the grounds of the Ryong Gang Hot Spring Resort on the 19th. Tomek (2002) gives no records of this species which was only first recorded in the Republic of Korea in 2002, before colonizing several ROK West Sea islands and a couple of mainland sites (e.g. the Guryongpo Peninsula). Kamchatka Leaf Warbler Phylloscopus examinandus (Not Yet Recognised by BirdLife/ IUCN). Two or more were heard calling and in song (along with 8+ nominate-type Arctic Warblers) in the grounds of the Ryong Gang Hot Spring Resort on the 19th. Tomek (2002) does not refer to examinandus, which was only recently split from Arctic Warbler, but Duckworth (2007) notes “Two forms were clearly separable by song in Pyongyang in spring 2003, “Birds with a repeated unit of a single note greatly predominated and occurred throughout the passage period; but on 30 and 31 May, five birds sang with a double-note repeated unit (‘dji-djim’)”. Based on this transcription, these five were most likely to have been examinandus. 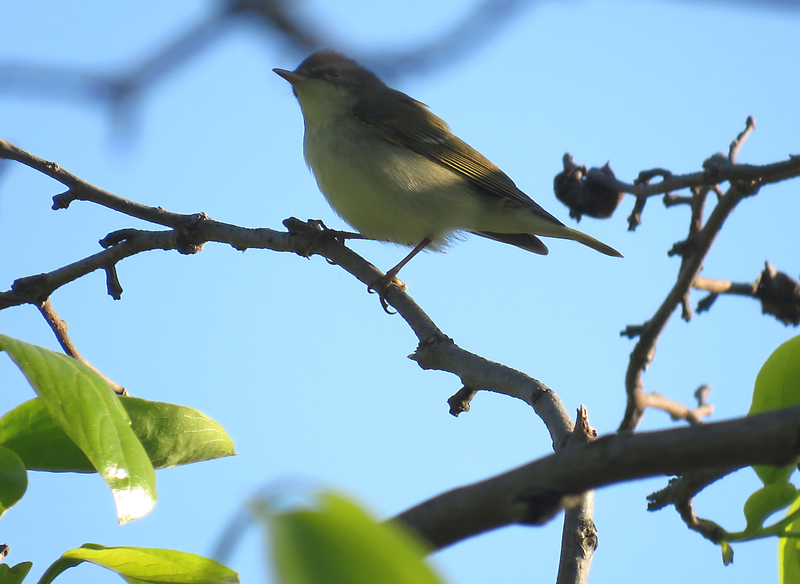 Japanese Leaf Warbler Phylloscopus xanthodryas (Not Yet Recognised by BirdLife / IUCN). 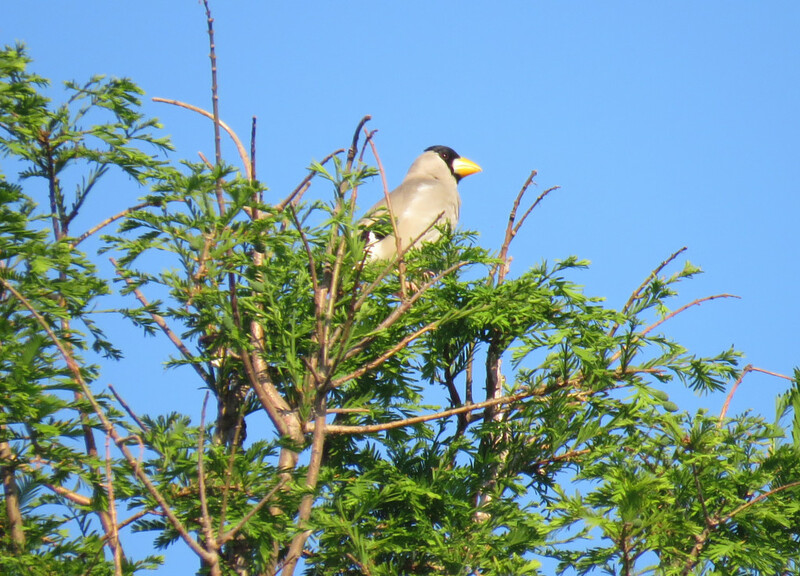 One was heard in song and shortly after another was heard calling about 200m from the first bird in the grounds of the Ryong Gang Hot Spring Resort on the 19th. A silent bird photographed close to where the second bird was heard shows multiple features suggesting this recently-split species including: big-looking head and wide bill with strongly orange underside; yellow-washed underparts, strongest on the throat, down the centre of the belly and on the vent; yellow tones to supercilium and eye-ring, and darker crown sides than centre of crown; strongly green upperparts (lacking grey tones), with a bright wing panel; and a distinct white greater covert bar. For some in-the-hand images of this species see the paper by Round et al. 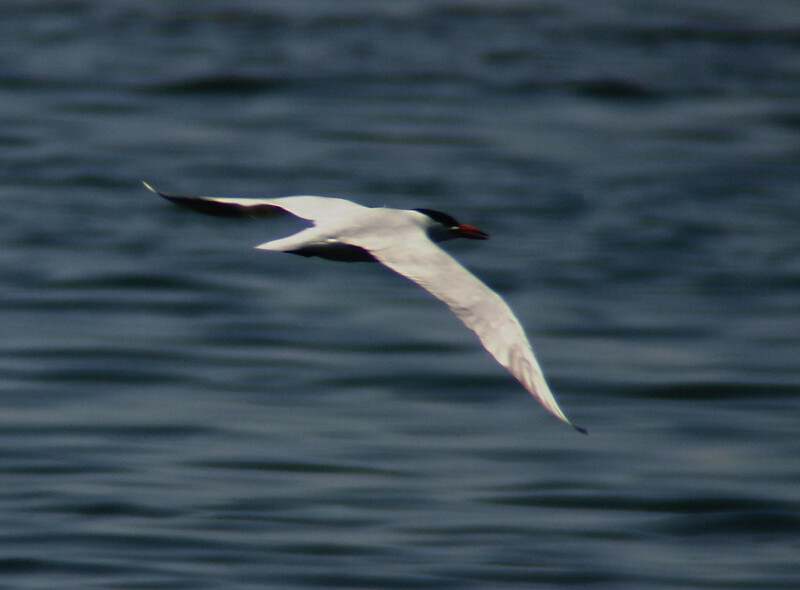 in BirdingAsia 23 (2015). Red-billed Starling Spodiopsar sericeus (Least Concern). One in Oncheon County on the 20th. First recorded in the DPRK in 2001 (Duckworth 2004); and as in the southern provinces, this species is perhaps more ‘expected’ now than a decade ago as it continues to expand its range on the Korean Peninsula. Japanese Grosbeak Eophona personata (Least Concern). One or more likely two photographed in the grounds of the Ryong Gang Hot Spring Resort on the 19th. Tomek (2002) found only seven or eight records in the DPRK in total. 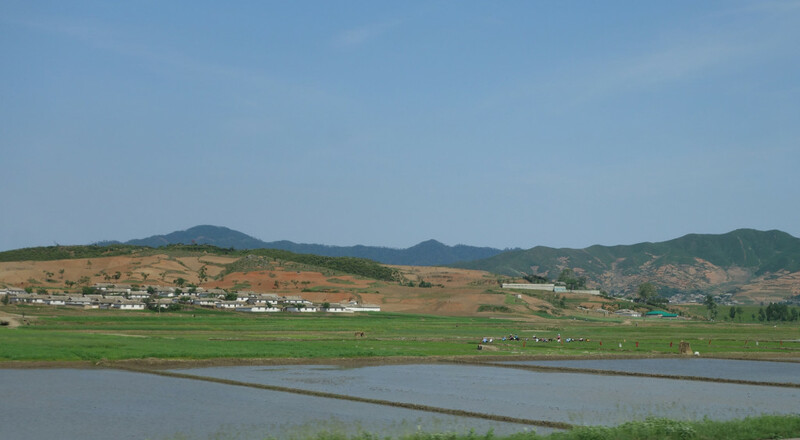 NOTE: Birds Korea is dedicated to the conservation of birds and their habitats in Korea and the wider Yellow Sea Eco-region. 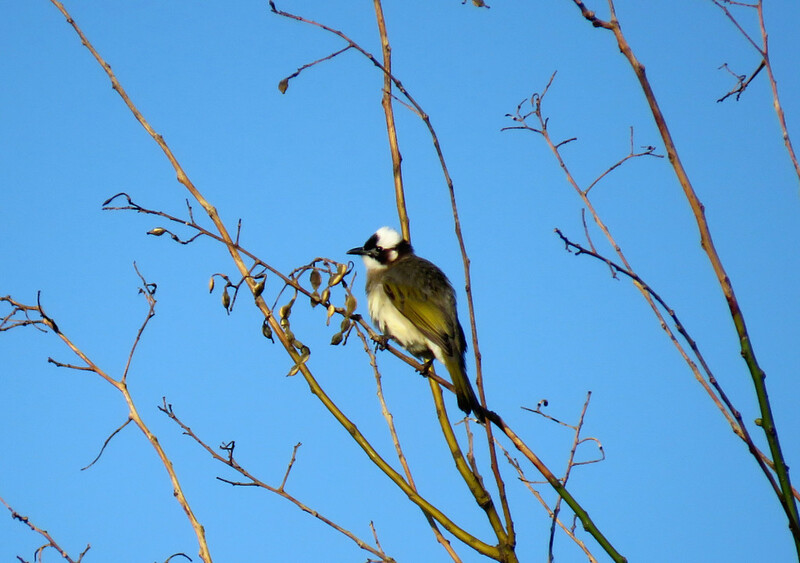 We are a small non-political conservation organisation that aims to provide best information on birds and their habitats to decision-makers, to help inform the conservation process. Birds Korea has an MOU with the Hanns Seidel Foundation (Korea). 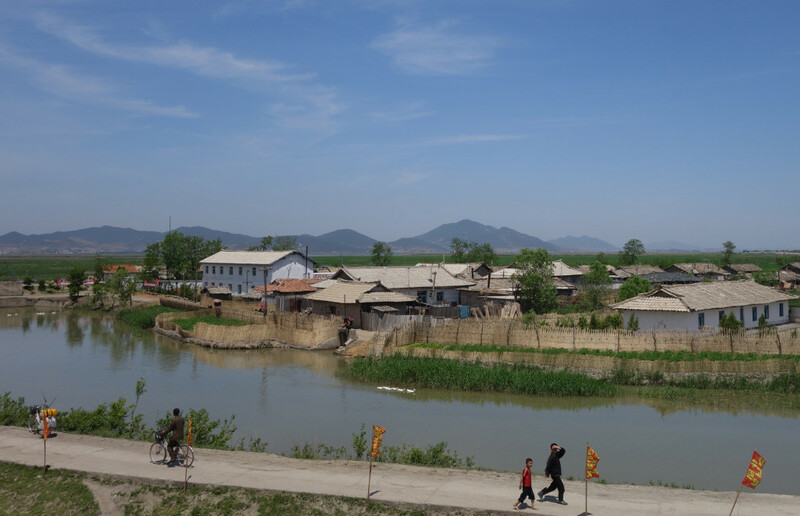 Dr Nial Moores of Birds Korea was contracted by the Hanns Seidel Foundation to help lead this bird research as part of a much-needed longer-term wetland conservation program supported by e.g. 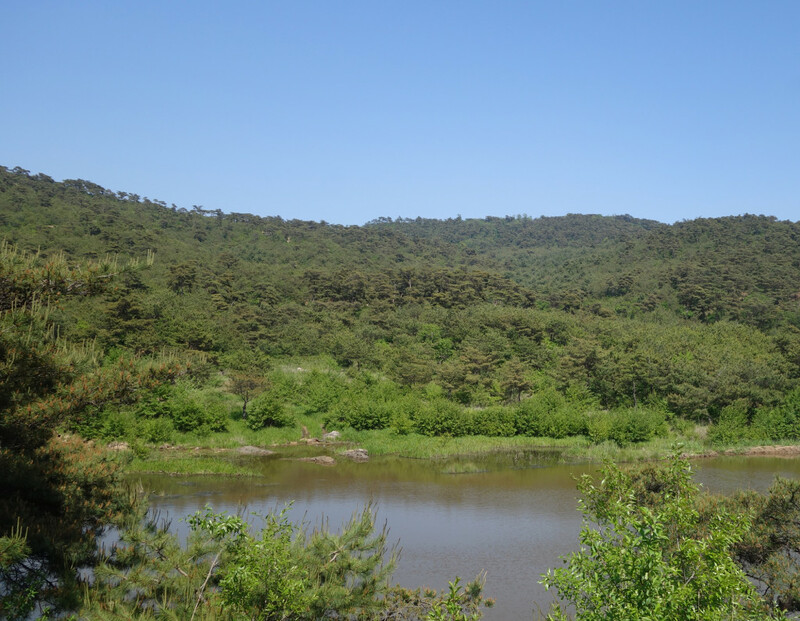 the intergovernmental Ramsar Convention Secretariat and several other international conservation organisations (most especially the IUCN), with the aim of conserving Korean biodiversity in ways that can benefit local communities. Duckworth J.W. 2007. Seasonality of the Arctic Warbler Phylloscopus borealis in northern Korea, with refutation of previous assumptions of Korean breeding. Ardea 95(1): 105–113.